A visionary precursor to the Internet made of index cards. Le Corbusier was one of many prominent figures enthralled by Otlet’s scheme of a “Universal Book.” He described it as a panorama of “the whole of human history from its origins,” and signed on to design an international “city of the intellect,” centered around the Mundaneum. In 1919, the Belgian government turned over 150 rooms in the Palais du Cinquantenaire to serve as a home for the Mundaneum, but five years later revoked the space to use it for a temporary exhibit on the nation’s rubber industry. 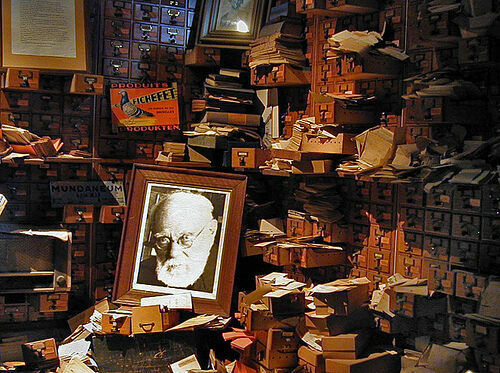 The Mundaneum moved into a series of smaller spaces, and eventually took over a parking garage before closing for good in 1934, the same year that Otlet published his magnum opus, “Traité de documentation.” Though Otlet’s name is little remembered today outside the field of information science, he deserves credit for developing many of the ideas behind the modern internet. What’s left of the Mundaneum persists in a museum in the Centre d’archives de la Communauté Française in Mons, Belgium. The tiny Belgian town's ancient version of Mardi Gras involves eerie wax masks, sticks for warding off evil, and ostrich plume hats.